Nipsey Hussle in Oakland, Calif., on March 29, 2018. The life of Ermias “Nipsey Hussle” Asghedom was celebrated Thursday before a crowd of over 21,000 at the Staples Center after he was fatally shot in South Los Angeles on March 31. Following his tragic death, the Eritrean-American who was born and raised in L.A. has been praised as a local philanthropist who was heavily involved in community development. He is of a small percentage of recording artists who have done something to combat the many ills of our society—from the prison industrial complex to gun violence, to police brutality and more. Hussle often hired the homeless and Los Angeles natives who had been recently released from prison to reduce recidivism. Among Hussle’s many notable accomplishments: the February purchase of the shopping plaza in his South Central neighborhood where his Marathon Clothing store is located; his support of Destination Crenshaw, a new arts project, open-air museum and outdoor art and culture center celebrating black Los Angeles. Hussle donated shoes to and funded the renovation of a Crenshaw elementary school’s playground and basketball courts. He launched Too Big To Fail as part of a partnership with Vector90 which led to the opening of a coworking space for a STEM initiative for local youth. There were plans in the works to duplicate the program in Atlanta, Baltimore, and Chicago. He also owned several other businesses and real estate. Hussle wasn’t just a musician, he was a movement. With this in mind, we’d like to put the spotlight on 10 others in hip-hop who share the same passion for social activism and have directly impacted the communities near and dear to them through various causes. There are many who often do not garner as much press for their charitable efforts: Jay-Z, Drake, Sean “Diddy” Combs, Nicki Minaj, Jaden Smith, Cardi B, Common, Akon and David Banner to name a few. It is only appropriate that we give them their roses now while they are still here, and to thank them for their grassroots efforts to increase civic engagement on the ground to make change through action. 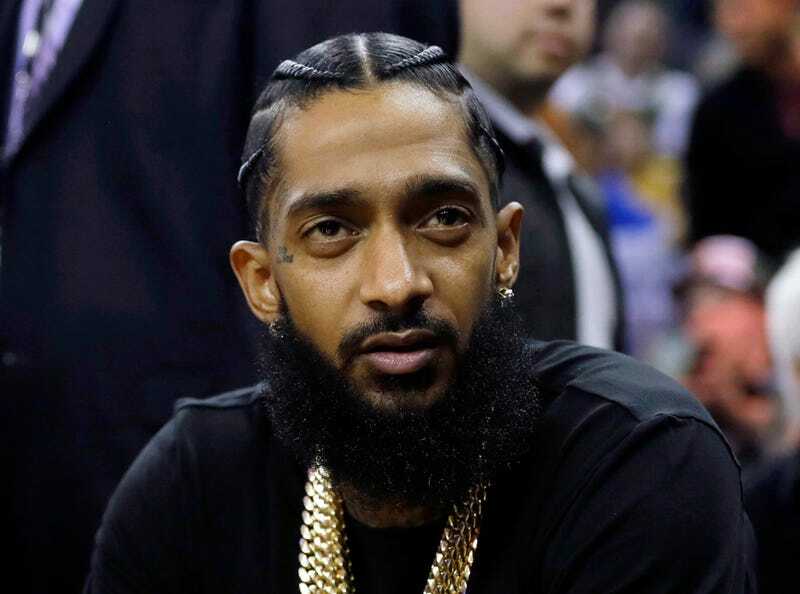 “I hope (Nipsey’s) memory inspires more good work in Crenshaw and communities like it,” former President Barack Obama stated in his letter which was read before Hussle’s memorial service. We hope so too. The marathon continues. Following the performance of his hit single “Bank Account” on The Ellen Show, 21 Savage introduced his new Bank Account project, where the Atlanta-based rapper donated a $21,000 check to open up bank accounts for 21 special students. Following his charitable efforts assisting the residents in Flint, Mich., during the clean water crisis, Big Sean has launched a competition to help fellow entrepreneurs with his organization The Sean Anderson Foundation. The Detroit rapper partnered with Ally Financial and the Thurgood Marshall College Fund (TMCF) to launch a competition called Moguls in the Making. Chance The Rapper is doing his part to help to save Chicago through his charity, SocialWorks. He has partnered with the Great Wolf Lodge to fund summer camp for Chicago youth, donated a $1 million check to the Chicago Public School Foundation to support the arts and partnered with Google to bring computer science education to public schools there. Google gave a $1 million grant to his charity and $500,000 directly to Chicago Public Schools. Two-time Grammy-nominated rapper Chamillionaire has become a successful tech investor and is using the return on investments to help others in need. He started a charity to support victims from Hurricane Katrina and donated at least $45,000 for its efforts; he financially assisted the family of a deported Mexican immigrant and created a pitch competition to invest $10,000 in a Black-owned businesses. Jadakiss and Styles P of The Lox opened two Juices For Life juice bars to combat the issue of limited access to healthy food which is prevalent in low-income neighborhoods. They opened their first location in their hometown of Yonkers, N.Y., in 2014 and partnered with Power 105.1 The Breakfast Club stars Angela Yee and DJ Envy to open a second location in Brooklyn. J. Cole turned his old Fayetteville, N.C., home—made famous on the cover of his album, Forest Hills Drive—into rent-free transitional housing for single mothers. His annual Dreamville Weekend offers several community-uplifting events in Fayetteville including an appreciation dinner, a career panel and events honoring community leaders. The efforts also inspire locals to become more civically engaged. Kendrick Lamar gave his high school $50,000 to help improve their music department; donated hundreds of thousands of dollars to Compton’s school district’s sports, after-school, music and other programs, and other local charities. Lamar won an award from the California State Senate in 2015 for his community work. Killer Mike, the Grammy-award winning artist and member of hip-hop group Run the Jewels examines the social and economic problems facing black Americans in his new Netflix series Trigger Warning. He has publicly proposed many ideas including community-based policing and is a new member of the board of directors of the High Museum of Art. He has been honored for his community work with the Bank Black program, Black Teens for Advancement, and the Atlanta/Fulton Commission on Children and its program Kids 4 a Change. The rapper/actor/activist received a proclamation from Atlanta City Council claiming July 17, 2017, in his honor. In January, Meek Mill announced the formation of the REFORM Alliance alongside Jay-Z and several businessmen and sports team owners who pledged to donate an initial combined $50 million to this effort. The org’s mission is to “dramatically reduce the number of people who are unjustly under the control of the criminal justice system—starting with probation and parole,” according to its website. Rapper and actor Queen Latifah will build a $14 million affordable housing complex in her native Newark, N.J. Latifah also plans to build 20 three-family townhomes with 60 units and a three-story mixed-use building which is expected to open in 2021. Previously, during a 2006 telethon for hurricane relief, she donated $100,000 to help victims of Katrina. T.I. is currently targeting his old neighborhood in Atlanta with a redevelopment strategy to spur its revitalization. “We wanted to provide development that would allow people from the area, who love the community, to be able to afford to stay,” he told Inc. “A lot of the buildings I’ve bought, we’re turning into mixed-use housing. One of the smaller residential projects will hopefully be ready by the end of 2019. We’re aiming to complete a larger development—more than 100 units—around the same time.” In 2012, T.I. launched the Give Like a King campaign in an effort to help homeless veterans, and For the Love of our Fathers to support those individuals who are suffering from Alzheimer’s disease. Sonya Magett is currently fundraising and recruiting to disrupt inter-generational poverty to create socio-economic change while increasing diversity in the tech talent pipeline by erasing the tech education debt that exists in marginalized communities in Brooklyn, NY with Code & Content Academy (CCA). CCA teaches grade 4-12 students how to create content and code (front end and back end) for websites, mobile apps and video games at schools, libraries and various programs in underserved communities.